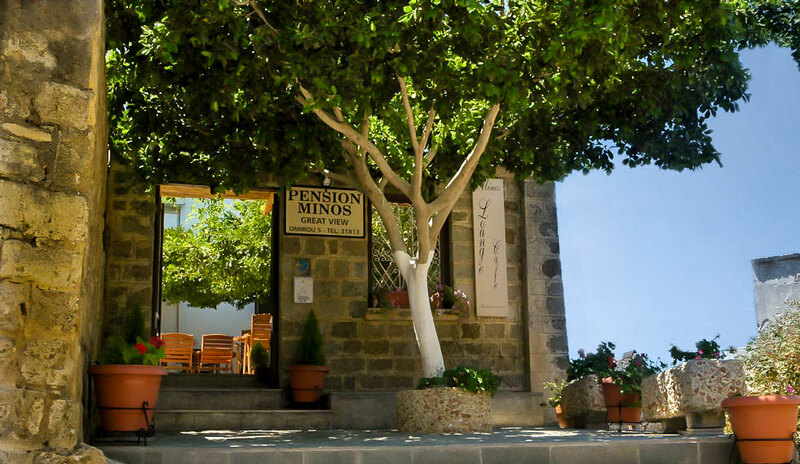 Minos Pension is built by the owners, John & Maria Lentis in 1987 and had a major rennovation in 2011. Since then John & Maria's family offers to their guests their hospitality and warmth in such a nice and clean accommodation, in a friendly atmosphere and very competitive rates! Minos is located within the medieval walls at the highest point, opposite to an old big wind mill and next to S. Theodori Byzantine Greek Church, at the beginning of Omirou Street. An ideal point for a pension which is a few minutes walking distance from all action but far enough from all the noise. Starting from here and walking down the picturesque small streets of the town, you will arrive exactly in the center (approx. 3 minutes), where Greek traditional stores and restaurants waiting for you. Here you will feel the magic of staying in a great and lively old city. You will enjoy the ancient glory and the peaceful atmosphere arrived from Middle ages, in a breathing distance from the Castle of the Knights with the tower of the clock beside, the minarets and the mosques, the Aegean sea and the mountains of Turkey at the background. Minos Pension is suggested by the most reliable guide books in the world, including Lonely Planet (in 13 translated versions). The Rough Guide lets go to Greece formers, the Routard, etc.